Are flexible solar panels finally catching up? A few years ago I documented a DIY project where I created self charging batteries using flexible solar panels. However, the batteries where just an experiment in evidencing; the art of make believe in realising new product concepts and evaluate said concept concept before any actual work is done. This experiment was part of my master thesis on how consumers could be encouraged to produce electricity in their own homes. 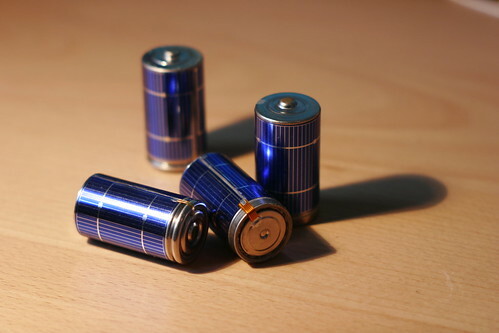 One of the key components missing at the time to make those batteries more than a mirage, where the lack of proper flexible solar panels. For some time there has been "bendable" panels available, but those where still attached to quite thick substrate. Actual cells in use. Not too curvy, these are! 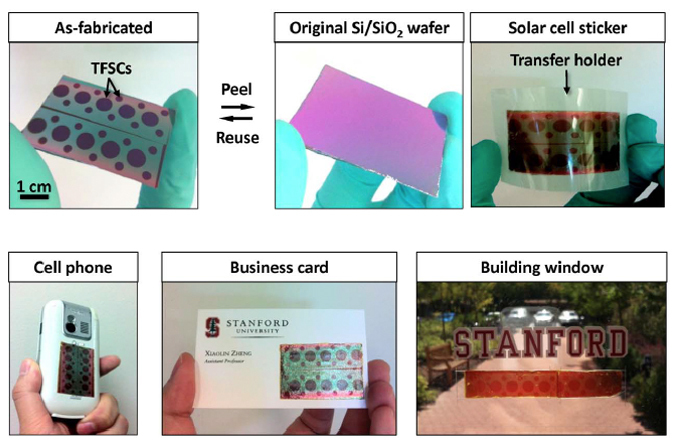 Now I find that researchers at +Stanford Engineering has developed a method to peel off the thin film Photo Voltaic (PV) cells from its substrate and transfer them onto various objects, even those with curved surfaces. Their method includes soaking the panels in hot water to loosen the cells from the original substrate which sounds suitable for any DIY project. The substrate is normally made of glass, not flexible, in solar panels. Substrate can also be made of special polymers (plastics) for thin film solar panels that are more or less flexible. The major new development, as far as I understand, is that the substrate is no longer necessary for the cells to function and thus can be removed. These new PV cells can be applied to non special materials and could give product designers new freedoms in adding powers sources to their products without compromising in their designs. Maybe this technology could be used to produce tear off pages in a booklet for DIYers to stick on any odd project laying around? Sign me up for a couple! Hi to every body, it's my first pay a quick visit of this webpage; this web site consists of remarkable and in fact fine information in favor of readers.